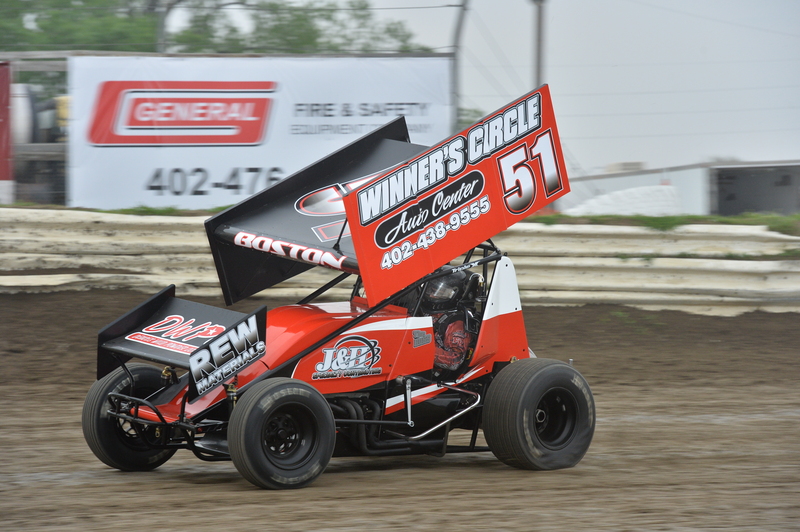 Mike Boston, 54 and a seasoned veteran from Lincoln, Nebraska crossed the finish line at the 2016 RaceSaver Nationals℠ in 7th place. However, the final standings did not reflect that. We will find out why as we visit with him more. Q: What was the first time you raced something? Mike: Age 11 in 1974 was my first race in motocross and that was my first experience racing. I raced motocross for probably 19 years. I worked at a motorcycle shop for Roger Kilbourn. His son ran micro-midgets and they had one sitting there. He asked me to race it and I wasn’t smart enough to say no, so I ended up racing both motocross and micro-midgets. Motocross on Sundays and micros on Saturdays and Sunday nights. We raced micros down in Springfield, Missouri then drove all night and the dropped me off at the track to race motocross. Q: When did you get into sprint cars? Mike: My first race was with Greg Boltz. Then I put my name in a hat with John Gerloff, because he knew Greg really well and drove his car a few times. I think 1994 was the first time that I sat in a sprint car, and that was through Greg. I was still running the micro-midgets and won the national championship in 1994. My main concern was the micro-midgets, but I ran 3 or 4 races in the sprint car. Q: You ran the 360’s up until Eagle Raceway started with the Racesaver class, right? Mike: Yes. 2012 was my last year in them, the same as most of the drivers at Eagle. Q: What do you think of the Racesaver class? Mike: I think it’s pretty neat. It’s very competitive, a lot more competitive than the 360’s. But like the 360’s where it’s getting unlimited where a motor costs $50,000 for a top of the line motor and a Racesaver you can go out and run for X amount of money; not nearly that much. It’s a much cheaper class. I mean, money still helps but nowhere near the 360 stuff which is getting out of control. Q: This may be a sore subject with you, but what do you think of the Racesaver rules? Mike: I think they’re really good. I mean, I really have no problems with the rules. I love how when you go to the Nationals; I mean, yes it’s an inconvenience when you roll up and have to sit in line to get teched, and then you run in the feature and you get teched again. I believe that if you have rules you have to enforce those rules. You know that when you go out for the feature that your car is legal and the guy next to you is legal or they’ll check it after the feature. But in the 360’s you knew that everybody wasn’t following the rules with their cylinder heads because nobody ever checked them. Rules are no good unless you enforce them! Q: Do you think having the RaceSaver Nationals℠s at Eagle Raceway is a good deal? Mike: I think it’s a great deal! I think that Eagle has one of the best facilities in the country and it’s centrally located. I travelled a lot when I ran the modified midgets; we went to New York for the Nationals and to Madisonville, Kentucky and California. The nice part is that every year at the same time you know where you’re going to be at. If you run a Racesaver you know that around the first of September that you’re going to be running your Racesaver at the Nationals at Eagle Raceway. When you plan your vacation you know where you’re going to be at. It’s not like some other organizations where you might be in New York one year and then California the next year. I think it’s a pretty great deal that Roger (Hadan) has put together and I think it’s just going to continue to build and build. Q: Where did you finish on Sunday last year at the Nationals? “HUH???”. But I didn’t gets PO’ed, I didn’t yell and scream because it was my oversight. I could go out there and find some little thing illegal on every car just because of oversight; like a titanium bolt in a brake caliper or whatever because they bought it that way. There might just be 1 titanium bolt on a front wheel rotor but there is that 1! That was my misinterpretation of the rule book also because if you read the rules because you can interpret it more than 1 way. I don’t have the rules in front of me but it says something like ‘No carbon fiber or titanium that’s rotating over 1 ½” in diameter’. I thought it was 1 ½” in diameter on the titanium like a driveshaft because it’s over 1 ½” in diameter or a brake rotor. Or a wheel center cover; I thought it meant 1 ½” in diameter not that it was the rotating part. But; a rule is a rule! They enforced it and that’s a good thing. Q: What do you think of the 3-day qualifying format? Mike: I think it’s a pretty decent deal; I mean I don’t know how you would do it any other way or make it better. Maybe passing points. But this way you have 3 shots at it. I like the last day where you take the whole combined points systems and that’s how you line up. I really like that part of it. If you have some bad luck on the first 2 nights you can still start up front of one of the features and work your way into the big show. Once again, I misinterpreted that the year before. I broke something and I had to come through the C and then the B on Saturday. Then I pulled off! If I’d have known it was a total combination of points I would have kept going. But, that was my bad. If I’d have just gone through the B Feature and kept going, but I thought “Nothing good can happen out of this” and I thought that Sunday was a whole new show. I’m old and it takes me a while to learn things. Q: What’s it like racing with people from all over the country? Mike: I’ve done it my whole life really. I think it’s neat getting to drive against other people and to have those people compliment your facility. I don’t think I heard one negative word all weekend as far as how fast the program was run or how good the facility was or even the PA system. Some times it’s good racing with people that you don’t know and other times it’s better to run against the local guys where you know what to expect. You know where they’re going to go. But with the outsiders it’s a little bit of a learning curve to run side by side with those guys. Q: I know that you got caught up in the mess on the 2-wide start of the finale that first year. What do you think of the 3-wide start? Mike: It was just one of those deals that year. You’ve got 27 guys out there out of over 100 and the ones that are in there are in there for a reason. As long as everybody is conscientious and we get through the first lap or two it’s not bad at all. If everybody calms down a little bit and let it get spread out before we start to get on it, it will be all right. It gets more people out there on the track and it makes it a little more interesting with the lapped cars. You’re always racing with somebody; it doesn’t matter if it’s the first lap or the 30th lap. There’s always racing; there’s always action going on. Q: Is there anything that we haven’t covered that you’d like to say to the drivers or fans who haven’t come to the Nationals at Eagle yet? Mike: Never give up! If it was easy, everyone would be doing it. There’s a good reason that there is 100 plus cars at the Nationals. Unfortunately not everyone can make it, but if you have enough will and drive you will make it there. And it will be a lot more meaningful when you make the show! That’s an accomplishment that you won’t forget.